Austrian rabbi and financier; born 1692; died at Vienna March 2, 1753; son of Gabriel Eskeles and son-in-law of Samson Wertheimer. 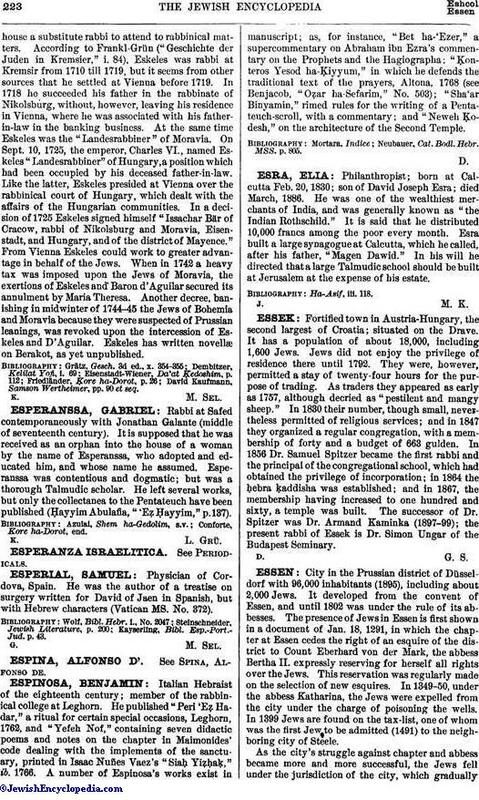 Eskeles called himself "Issachar Berush of Cracow," although at the time of his birth his father was rabbi of Olkusz, Poland. Owing to his family connections, Eskeles was named rabbi of Kremsir in 1710, when he was only eighteen years old; but as he had to absent himself very often on account of business affairs, he had in hishouse a substitute rabbi to attend to rabbinical matters. According to Frankl-Grün ("Geschichte der Juden in Kremsier," i. 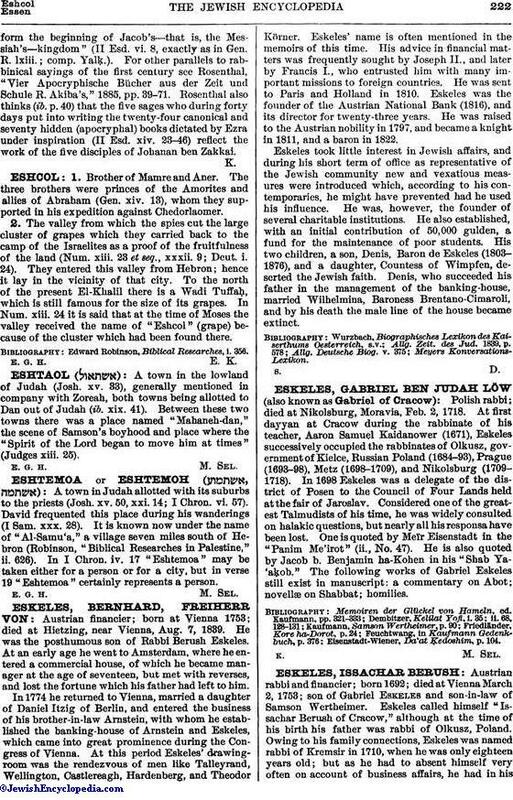 84), Eskeles was rabbi at Kremsir from 1710 till 1719, but it seems from other sources that he settled at Vienna before 1719. In 1718 he succeeded his father in the rabbinate of Nikolsburg, without, however, leaving his residence in Vienna, where he was associated with his father-in-law in the banking business. At the same time Eskeles was the "Landesrabbiner" of Moravia. On Sept. 10, 1725, the emperor, Charles VI., named Eskeles "Landesrabbiner" of Hungary, a position which had been occupied by his deceased father-in-law. Like the latter, Eskeles presided at Vienna over the rabbinical court of Hungary, which dealt with the affairs of the Hungarian communities. In a decision of 1725 Eskeles signed himself "Issachar Bär of Cracow, rabbi of Nikolsburg and Moravia, Eisenstadt, and Hungary, and of the district of Mayence." From Vienna Eskeles could work to greater advantage in behalf of the Jews. When in 1742 a heavy tax was imposed upon the Jews of Moravia, the exertions of Eskeles and Baron d'Aguilar secured its annulment by Maria Theresa. Another decree, banishing in midwinter of 1744-45 the Jews of Bohemia and Moravia because they were suspected of Prussian leanings, was revoked upon the intercession of Eskeles and D'Aguilar. Eskeles has written novellæ on Berakot, as yet unpublished. David Kaufmann, Samson Wertheimer, pp. 90 et seq.